If it's good enough for taxi cab drivers and police officers, it should be good enough for you. Just knowing this fact gives you a glimpse of the type of attributes the 2003-2004 Ford Crown Victoria offers. Obviously, there is plenty of power and sharp handling, as well as a thorough safety configuration and the type of durability that won't quit on the job. In other words, the 2003-2004 Ford Crown Victoria is the choice in lines of work that are wholly dependent on smooth-running, high-performing vehicles. There isn't a more trusted car on the road. The four-door 2003-2004 Ford Crown Victoria is available in a sedan body type in four models: Police (P71), Standard, LX and LX Sport. The 2003-2004 Ford Crown Victoria offers a spacious interior that holds up to six people. With 111.2 cubic feet of passenger volume, the numbers back this claim up easily enough. For 2003-2004, the seat foams, fabrics, sew styles and headrests have been altered on all Crown Victorias to improve comfort and appearance. 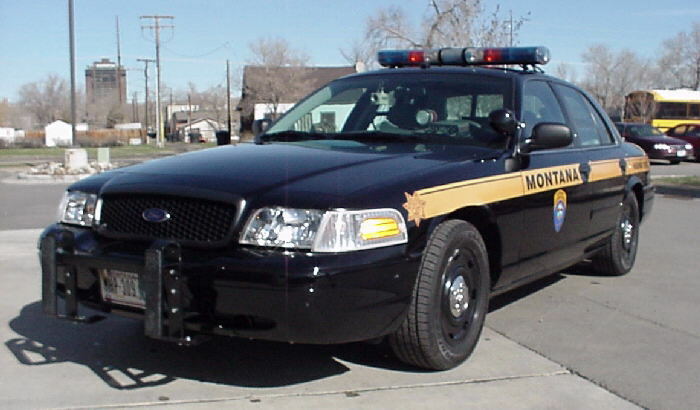 Right now, the Police (P71) version is for sale only to Law Enforcement Agencies as a "new" vehicle, but can be purchased by anyone as a pre-titled used car. Entry-level Standard models offer such features as air conditioning, power steering, cruise control, cloth upholstery, 8-way power driver seat, cupholders, column shifter and an AM/FM/cassette. For more interior features, one need only step into the upper level trim models. The LX adds a number of extra goodies to the cabin, including automatic climate control, front power lumbar adjustment, 8-way power passenger seat, power-adjustable pedals, leather-wrapped steering wheel with radio controls, remote keyless entry and an AM/FM/cassette/CD player. At the top of the line, the LX Sport has leather upholstery and front bucket seats for five-passenger seating. The 2003-2004 Ford Crown Victoria has a clean, aerodynamic outer design that features wide door openings, a large glass area for good outward visibility, wraparound headlamps and heated foldaway dual remote-control power outside mirrors. If you know who employs the Ford Crown Victoria, you know what kind of performance to expect. The rear-wheel drive Crown Victoria is built to satisfy heavy demands, and in turn can also do everyday driving with ease. Standard and LX models have a 4.6-liter SOHC V8 engine with 224 horsepower at 4800 rpm and 272 lb-ft of torque at 4000 rpm. LX Sport models come with the same engine but with a dual exhaust system, increasing the performance to 239 horsepower at 4900 rpm and 287 lb-ft of torque at 4100 rpm. LX models with a handling and performance package are given the option to upgrade to this speedier engine. 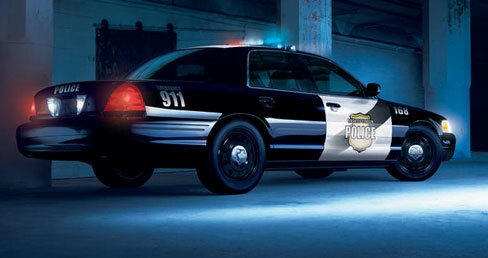 The Police (P71) Version is also equipped with the 4.6-liter SEFI V8 engine but has 250 horsepower. These also come standard with dual exhaust, 200 amp alternator, oil and transmission coolers, along with other "Police only" options. LX Sport models are designed for adventure, and come equipped with a new rear air suspension, revised front springs, tuned shock absorbers and stabilizer bar. Also included are P235/55R17 black sidewall Goodyear Eagle LS tires and exclusive 17-inch bright machined contemporary five-spoke alloy wheels. The attention to safety and security is one of the key attributes of the 2003-2004 Ford Crown Victoria. All models have advanced dual-stage front airbags, which are deployed according to crash severity, safety-belt usage and the driver's seat position relative to the steering wheel. The system is equipped with a new feature, a passenger seat sensor. In addition, all models also come with antilock 4-wheel disc brakes. Copyright © 2004-2010 PoliceCars.us. All rights reserved.